Marine Cpl. 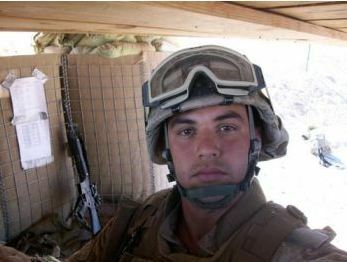 Jonathan D. Porto - Run for the Fallen New Hampshire, Inc.
26, of Largo, FL; killed in action supporting combat operations in the Helmand province, Afghanistan. Known to family as Jonny, his mother, Rachel Bernaby, remembers that even as a toddler, he had strong likes and dislikes. “He hated having diaper changed,” she said. 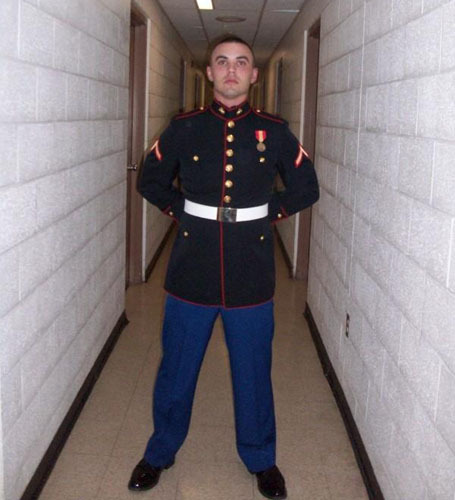 “I would actually lay him on the floor and I would have to straddle his chest and change him backwards to change his diaper.” Jonny was the kind of man who knew what he loved and dedicated himself fully to those loves - the Marines, his wife, and a baby daughter he never got to meet. Jonny was the youngest boy of eight children, graduating from Timberlane High School in Plaistow. He was living in Pinellas County, FL installing hurricane shutters for a living when he called to talk to his mom. Jonny always took pride in everything he did, but he was tired of just doing jobs. When he called her that day, he told her, ‘I’m thinking of going into the military.’ He had already gone to see the Marine recruiter. She was shocked. Jonny found purpose and his passion when he joined the Marine Corps in March 2008. He enlisted in part because he had trouble finding a job in the poor economy, said his father, Steve Porto. 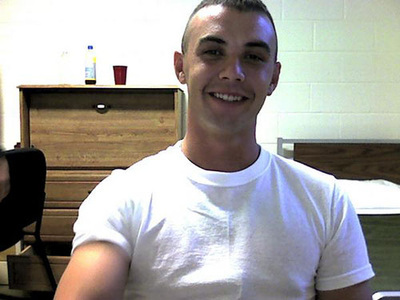 And he loved it, telling his mother that he even enjoyed the grueling basic training he went through at Parris Island. That’s also where Jonny met his other true love - outside a bowling alley on a small army post in Aberdeen, Maryland. Rachel – soon to become his wife - noticed him – ‘a Marine in a funny brown shirt and sandals smoking a cherry cigar’. Their chance meeting evolved into a conversation and a game of pool. “He asked if he could kiss me and I was like sure whatever and then he kissed me,” she said. “My knees went weak, I thought I was going to fall down and my whole body tingled.” It was not love at first sight. They called it love at first kiss. The couple married 10 months later. When Jonny proposed to his Rachel, he didn’t have a ring to give her. So he improvised. He took the small chain from his dog tag and wrapped it around Rachel’s finger. “I showed it off like it was a freaking 2-carat diamond platinum piece of work,” she said. Rachel Porto eventually got a real ring a few weeks later, when he surprised her at her family’s cabin at Walt Disney World. They started a family immediately after getting married, because Jonny knew he was being deployed to Afghanistan. Rachel was eight months pregnant when he left. Another Marine wife snapped a photo of the couple that day. Jonny was kneeling before Rachel, his hands on her pregnant belly, talking to his unborn baby. He was in Afghanistan when his daughter Ariana, was born. He was able to be “in” the delivery room via a fuzzy phone connection. That’s the closest he came to meeting his daughter, he was killed two months after her birth when his vehicle rolled over during combat operations. Jonathan enlisted in the U.S. Marine Corps in March 2008. An honor graduate from Paris Island, he received two meritorious promotions. Corporal Porto serving as a Small Arms Repair Technician. 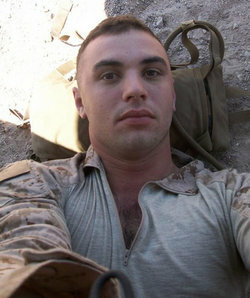 For his superior leadership skills, he was promoted to Corporal in December 2009. His awards include the Afghanistan Campaign Medal, National Defense Service Medal, Global War on Terrorism Service Medal, and NATO International Security Assistance Force Medal. Jonathan is survived by his wife Rachel and daughter Ariana; mother and stepfather Rachel and Brian Bernaby; father Steven Porto; siblings Rebekah, Stephanie, Sonya, Dominic, Benjamin, Emilie, Kristen, Christopher and Joshua.